Niche: Helping tax planning accountants get more clients using Facebook ads. Following too many people, listening to too many voices, changing niches every 3 phone calls and constantly re-upping for another hit of Gary V and Grant C's social media meth to keep him wired and lost in their labyrinth. 1. Why following too many people, watching videos on YouTube, keeping up with FB and Instagram and trying to actually start a business is impossible and a pipe dream. 2. Why picking your niche based on what other people are doing and changing your niche every three phone calls is not the way to achieve anything, ever. 3. How it took a financial life or death situation to finally wake him up from his delusions, get focused and commit to one thing. 4. 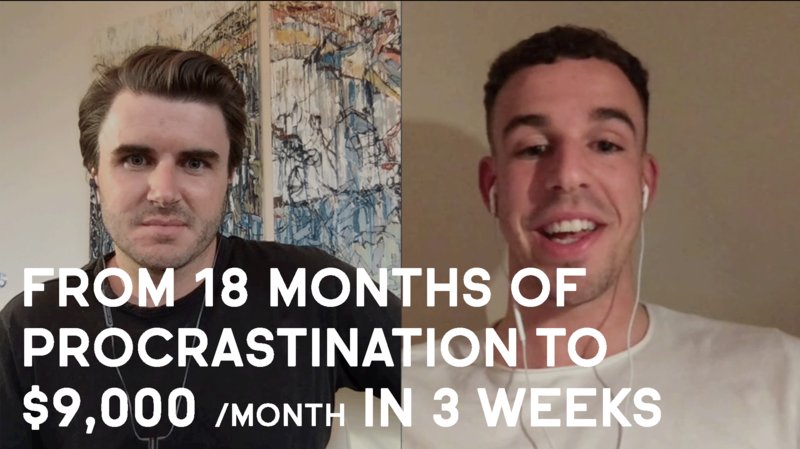 Why Niall ignored week two of the Consulting Accelerator program for 18 months until he hit rock bottom and had to fight, and why doing it completely changed his life. 5. Why deleting social media, cutting the power cord on his TV, giving away his PS4 and putting his phone in the bathroom draw lead to getting 3x clients in 3 weeks. 6. How to get clients using LinkedIn search, direct messages, a 15 min chat and a strategy session and how Niall used it to get to $9,000 /month in 3 weeks. Pick a niche and stick to it -- The grass isn't greener on the other side, it's greener where you water it. Block out all distractions -- Sit down in a quiet place, take out the Consulting Accelerator physical workbook (part 1) and read the entire "Week 2" mindset training from start to finish -- It will seriously change your life! Sam Ovens:	Hey, everyone. Sam Ovens here, and today I've got Niall Heaton, and he's a member of the Consulting Accelerator program, and he's one of our members. Niall was able to ... Well, before he joined Consulting Accelerator, he was a 20-year-old football player and didn't really know where he wanted to go, and he wanted to start his own business but didn't really know how to get it started or get it done. He joined the Consulting Accelerator program and he was able to start his own consulting business helping accountants get clients with Facebook ads. And not only that, he's been able to get three clients and he's now making around $9,000 per month, recurring every month, which is just over six figures. Congrats on your success, and I'm looking forward to zooming in and seeing how this all happened, how this transformation happened from back then to now, so that other people can learn from your journey and apply these lessons to their own life, so how's it going? Niall Heaton:	Yeah, good, Sam. How are you? Sam Ovens:	Good. So let's start at what was going on, what was life like before you joined the Consulting Accelerator program? Niall Heaton:	Yeah, sure. I joined the Consulting Accelerator ... It's exactly in ten days, it'll be exactly 18 months time, so it was the 28th of October, 2016. At that point, I was playing professional football, so soccer, and life was good. I was kind of living the dream if you'd like to say, for a lot of young boys growing up. It was good, but I always had that entrepreneurial flare. I always wanted to do something extra, something more. At the time, I was following a lot of entrepreneurs on YouTube. I saw one of your ads. It totally resonated with me, and looking back, I can't believe it's 18 months ago. It feels like last week. Yeah. I took the course, I flew through it in a few weeks and I didn't take it all in. Looking back now, the bits that I missed and the bits that I neglected were probably some of the most important parts, which fortunately, now I've gone back through and realized how important they were. And yeah, I managed to get my first client. It was the sixth of this month. I got my second client on the 13th and my third client today, so yeah, 18 months with nothing, and then in the space of two weeks, three clients. Yeah, I'm really, really happy about that. Sam Ovens:	Nice. Let's talk about why ... Let's zoom in and just focus on one part at a time, so we can get this clear. Before you joined the program, what made you wanna start your own business? What made you even interested in consulting back then? Niall Heaton:	Yeah. I always liked the business model. I always wanted to do it, as well as obviously concentrating on my football, but I didn't have the right mentality back then that I do now from going through week two training, so I was focusing on a lot of different things. There's a lot of information out there on the internet. It's hard to kind of know who to listen to, so I was trying loads of different things in my spare time. Yeah, my focus was all over, and I weren't quite sure where I wanted to be in life. I was doing well but I just felt as if I wanted more, I wanted to do something to do with business. I was stuck between this, drop shipping, loads of other different business models. Decided to go with this one and run with it. Yeah, I mean, looking back, I just wish I'd have taken the training more thoroughly than what I did. It's a shame it's taken this long to realize, but I'm glad it's happened now rather than more years later. But yeah, I was just confused about where I want to go, what direction I wanted to go in. For that reason, I was just unfocused on things. Fortunately, in terms of my football, my talent kind of took me to where I was, but that's not enough if you wanna get to the highest level. It's funny how things in the Consulting Accelerator in week two kind of relate to things as an athlete too, getting to the top level. Fortunately, I was able to train and see some of the best footballers in the world and kind of look at their routines and I look back now, and the things that you talk about in week two, they were doing themselves to get to the top level. So it's funny how everything is related in some way, which you do talk about. And yeah, if I'd have known that back then, then maybe things would be different with my career 'cause I didn't have the right mindset at all. But yeah, that's where I'm at now and yeah, I've got more clarity, I know where I want to be. I've got my goals, my alchemy of self, the new person I want to be, I'm slowly growing into it. Yeah, I'm excited for the future. Sam Ovens:	Nice. We understand where you were before you joined. Now let's talk about immediately after joining. You've just enrolled in the program, you're still playing football. This is 18 months ago, you start going through the week one training and whatnot. Tell me what happened then. Niall Heaton:	I pretty much just skipped week two, I went straight to the tactics and the outreach and trying to learn the skills. I picked my niche and like many people do, I hopped between different ones. Did outreach to a lot of different niches, got feedback, but I didn't stay in enough time in a niche to kinda nail one down and yeah. Looking back, that's completely the wrong way to go about and wrong way to do it. And I just completely- Sam Ovens:	What niches did you pick? Niall Heaton:	Dental, chiropractic niche. Basically, I was looking at what people were getting success with in the Facebook group and just jumping on that, which probably wasn't the best idea at the time. Sam Ovens:	It's funny, everyone things dentists and chiropractors is the best people to go for. They're like, "Oh, dentists have lots of money, so do chiropractors." It's crazy. People are drawn to it. So you were looking at what other people were doing and you'd pick a niche like dentists or chiropractors, and then, what did you do then? Were you trying to find out what problems they had? What happened next? Niall Heaton:	Yeah, so straight into the worksheets to the outreach to try and kinda see what problems they had. I remember ringing up some dental offices and pretending I was doing a university assignment and kinda calling them and asking what the problems were, those sort of things. Yeah, that's kinda the stage that I was at. I remember doing lump email, I was sending letters to people, but it was still too broad. I weren't passionate enough about it. It's a funny one with the passion thing because the niche that I'm in at the moment, I'm not overly passionate about it, but because I've been in it for that long, I know the ins and outs and people's problems, so I don't necessarily think you have to be passionate about it but if you have a good knowledge of the industry, then that's something you can use to your advantage. So at the time of joining the Accelerator, I hadn't had a typical nine to five job, like football's all I'd known, so I didn't really have much experience in any other niche really. I was thinking of things that I could do within the niche of football, but obviously, I was still trying to progress my career too, so yeah, it was a funny one. I didn't really have any experience in anything really, other than football, so that's where I was at and that's, as I say, I just looked at what people were doing well in, in the group and jumped on that, really. Sam Ovens:	Were you able to identify a problem in any of these niches? Niall Heaton:	Not one that stuck out really, with them all. I knew certain procedures that different niches would like more of, but it weren't enough of a problem because a lot of people were, you know. I didn't have anywhere to differentiate myself 'cause I didn't know the industries well enough. So not really, I wouldn't say that my messaging on the marketing or anything was really honed out. I didn't have enough experience and I didn't have any connections, I weren't speaking to enough people and the most important thing is I weren't in a niche for long enough. Sam Ovens:	Yeah, that sounds like that's the big one there that I wanna talk about. How long would you say you spent trying to work on and submerge yourself in each niche when you were hopping around back then? Niall Heaton:	Yeah, not near long enough. You recommend to do at least 30 calls, so you can at least get a clear idea of if it's your script that's wrong, if it's the messaging that's wrong. I'd do two to three calls, I think, "Right, okay, it's either the script or it's the messaging or something." And I'd change it and more often than not, I'd change it to something even worse, so yeah, just that's a big one, you know?. Stick in a niche, even if you're not passionate about the niche. Like, with accounting, for me, I'm not passionate about accounting, but I've been in it for that long that I know the ins and outs and I know what they want, I know the language they speak and specifically, it's not even accountants really that I work with now, it's more tax professionals that are looking for IRS debt resolution clients. I've managed to narrow down and hone my message in that much, by speaking to that many accountants and tax professionals, and I know exactly what they want. As I was saying to you before the call, as soon as I changed my message into something these guys really wanted, the strategy sessions just came flooding in. Yeah, it was kind of taking them from their agitated situation to the desired situation. I was the vehicle for that. Yeah, yeah, it's been great ever since. Sam Ovens:	Let's talk about one piece of the story at a time. We do it in chunks like that so that people can understand the journey. So the reason why you weren't successful back then is because you were jumping around all these different niches, seeing other people's ... what they were doing on Facebook, you'd only stick to it for about two or three calls. I'm always interested in this because I say in the training, "Stick to a niche, don't niche jump." But yet people niche jump, you niche jumped. When it says that in the training, why do you go and do it? Niall Heaton:	Yeah, Sam, I don't know. You're right. I mean, you've gotta stick in there long enough, like I said, you know- Sam Ovens:	But what I wanna know is why? Why did you jump? Niall Heaton:	That's a good question. As I mentioned, there's a lot of information online, so for example, when I was in the dental niche, I'd do a lot of research on that and then I'd find out someone on the internet said, "Oh, it's really competitive, it's hard to get clients in there." And I'd think, "Right, okay, best to jump to another niche." I go to the chiropractic, I'd do two, three calls, do a bit more information on the niche and the industry. People who are doing digital marketing for this industry was saying it's competitive, it's hard to get clients. Yeah, I'd hop to another one again. It was only until I'd run out of options really, and I went with accounting and I've stuck with it for that long. Sam Ovens:	It's interesting. It's like any piece of information, regardless of you fact checking it and seeing if it's really legit and factual, it just causes you to change your mind. And I know this isn't just you by the way, this is everyone on planet earth. Niall Heaton:	Yeah, I mean I'm glad I went through it 'cause I'm never gonna make the same mistake again. I know a lot of people go through it, 'cause a lot of people mention it in the Facebook group, I see people who ... I see the same people who've chosen a niche and then the next week later said that they're choosing another niche. I don't judge them 'cause I was in that position too, I did the exact same. I mean I feel now as if I'd have stuck with dental, then 100% I'd have clients now because I know the niche that well, I know the industry that well. Yeah. I think, to be honest with you, I did take the information in the course a lot more seriously because I'd made a commitment, I'd obviously paid for the course, and I think when you pay for it, you're more committed to taking it and learning it. But I can't, I wish I could give you an answer as to why I kept on changing niches and industries. Yeah, I mean just curiosity maybe as well, see if the grass is greener on the other side, but a great quote from the training is the grass is always greener wherever you water it. And yeah, I like that one. Sam Ovens:	I always tell people, "There's people making millions of dollars a year with lawn mowing businesses." And every type of business you can imagine. It's not the niche, it's your commitment to the niche and the grass isn't greener on the side, we water it. Niall Heaton:	Yeah, I love that quote, I've read it in the training last week. I've wrote it down in my mindset material. I loved that, so yeah. Sam Ovens:	What changed? Now you've been able to pick a niche and settle in it, so what changed from when you were hanging around and niche hopping after every three calls to finally settling on something? Niall Heaton:	Yeah, well obviously, there was a big 18 month period from when we first joined the Accelerator to actually getting my first client, so there was a lot of ups and downs within that period. I thought consulting really wasn't for me, I considered, again, different businesses, different business models, but really it all changed on ... let me double check, the fourth of this month. I was in a pretty desperate situation financially as well as not knowing what I wanted to do again. I looked back kind of at my life, and I'm only 21, but the biggest changes have come from, I've either been in a desperate situation or some kind of traumatic event's happened and I've made a change in my life for the better really, and that's kinda what's happened on the fourth of this month. I was in a desperate financial situation because I'd spent loads of money of different courses and trying to get more information, starting different businesses and I thought, "You know what? I'm just gonna go through the whole training again and I've got nothing to lose now really," because my rent on the place that I'm in now, it ends on the 11th of next month. Basically, I wanted to make enough money before then, so I didn't have to move back in with my parents, so that was kind of one of the goals really. I was like, "Okay, I need to make enough money before then." So I went back through the training, week one, done it all, and then week two, it was all new because I'd never done it. I'd flicked through it, but I'd never taken it in and that week two pretty much changed my life. That was the best, like the Facebook ad stuff is great, the outreach stuff is great. Week one's great but week two is the one that I neglected 18 months ago, the biggest, the most, and I've realized that it's the most important week for me in my situation. If I'd have taken it seriously back then, then maybe things would be different now, but yeah, I love it. I go through my mindset every morning, every night. I have my standards that I don't want to breach. I have my future self I'm growing into, the person I am now still tries to fight even before sales calls, I still get a bit nervous but I go through the affirmations and I can feel the change in myself within, what? 20 days? Just under 19 days, I could feel a change in myself in the first week. Yeah. Week two, I'm gonna go through that every month, the whole training, make sure I go through it every month. Like I said, I go through my mindset twice a day and it's great, it really is. I've got clear goals for the future and I know that I'm gonna reach them now 'cause I don't drop my standards. The things that let me down, I used to go out and go out with my friends. It's funny because the whole reason I started this is because I wanted enough money to go out with my friends, and go on holidays with my friends, and do all that sort of stuff, but now I'm focused on this and I've got clear goals. That sort of stuff doesn't seem as important anymore. I still wanna enjoy time with my friends and go out with them, but if I have to not drink one night because I'm up at 6:00 AM the next morning or come home early, I'd do it. Yeah, it's all about sticking to those standards. Sam Ovens:	Got it. So it's interesting, for the first 18 months, you're pinging around everywhere and you had neglected week two, the summaries, and then when you finally got into a desperate survival situation, you did week two. Niall Heaton:	Yeah. Sam Ovens:	That's interesting why you didn't do it in the first 18 months. Why did you go into the other stuff but skip that? Niall Heaton:	Good question. I think you're the only ... I'd taken a lot of courses and you're the only person that talks abut this stuff, so I think, I didn't think it was really that important, but it really is. It's so important to go through week two and do the alchemy of self worksheets and workbooks. Figure out the person you are now is not gonna achieve what you want and your goals. It's important to kind of jot down and make sure that you know the person who is, you've got to grow into it. That's the biggest thing that I've taken away from that. The biggest thing that I do now is kinda put myself in that third person and look at the self that I am now. If I feel tired or I don't want to do anything, I just put myself in the third person and make myself do it. But yeah, like I said Sam, I've taken a lot of courses and a lot of different things, paid for a lot of different things. But you get the mindset stuff and a lot of mindset stuff's about kinda looking in the mirror, and shouting at yourself, and trying to G yourself up, but it's not like that whatsoever. There's a process to go through. Yeah, I don't think a lot of people are talking about that stuff. That's why I didn't take it that seriously, but because I was in a desperate situation, I wanted to make sure I went through everything. Even the start of week two, when I was going through the first module, I remember just thinking, "I don't need to do this, like this is the biggest waste of time ever." And then I complete the first module and ever since then I was hooked. So if you're in the same position as me and you don't think it's that important, push through the first module and you'll realize how much your life will start to change already. That's not some kind of cheesy thing. It really did happen, it happened to me. Sam Ovens:	Yeah, it's interesting 'cause you kept changing your niche and you don't really know why you didn't listen to the advice not to, and then I say, "Do week two, do week two." And then you didn't do that either, it's the same thing, you didn't want to really define yourself and pin yourself down and face yourself, you know what I mean? Niall Heaton:	Yeah, exactly, exactly, and the best thing about it all is ... Well, maybe not the best, but looking back, as I mentioned, I was fortunate to be around a lot of successful football players. I look at the training in week two and when I look back, all those guys are doing it, so they had irrefutable standards that they did every morning in training, before training, after training. The diets are so clean, everything was perfect. Me and the others were sat there wondering, "Why are they doing this stuff?" But I think to get to the top of any industry, any level, anything doing really, you've got your goals and you've got your irrefutable standards. One thing that kind of sticks out in my mind now, one of the coaches used to say to us all, which none of us took any notice back then, but now I look back, it was one of the biggest things. And one of the coaches used to say, "You may lose your motivation now and again, but never lose your discipline." And I didn't really get it back then, but after going through week two, I totally get it now. There's gonna be some days where you don't wanna get on a call, I still get those days now. I'm only 20 days through doing week two and kind of going through the mindset stuff, but I've got my standards that I'm not gonna drop no matter how I feel. Yeah, no matter how much I might not be motivated some days to do stuff, I'm always gonna keep my discipline, I'm always gonna get up at 6:00 AM, I'm always gonna go through my mindset material, I'm always gonna meditate in the mornings, and my morning routine, I'm never gonna jeopardize that for nothing. Sam Ovens:	What really changed? You said there was a huge change in yourself and everything from week two, so between who you were then and then who you are now, what are the key changes? Niall Heaton:	Routine really. I looked at my highs and my lows, so I wrote down my low points and kinda where I'd sabotaged myself. When I didn't stick to a routine, that's when everything got chaotic in my life and nothing really got accomplished. So now I have a strict morning routine that I complete every morning, every day, even on the weekends, Saturdays, Sundays, and I feel so much better. I feel like I can achieve anything throughout the day now, so having that down in my mindset material, my irrefutable standards, my daily morning routine, that's a big one that I don't wanna compromise and I won't compromise, and that makes me feel a lot better. I feel as if I can go out and achieve whatever I set out for the day. As I mentioned, the big one's kinda stepping out of who I am now and putting myself in a third person and looking down at the character and thinking, "What's going well and what's not?" And what's not going well, I jot them down and I make an affirmation about them. Before sales calls, because the three clients that I have are in the US and I was so nervous and scared before getting on the phone with people who weren't from the UK. I thought they were gonna judge me, that it weren't gonna go well, they're gonna think, "Who's this weird guy on the phone with me?" But now I have that in my affirmations where I don't judge other people, so I don't feel as if they judge me and it's great. I can get on the phone now, no problem speaking to anyone really. So a lot's changed. Sam Ovens:	You said before your life used to get chaotic. I think this is what happens to a lot of people. That's why I wanna zoom in on this. 'Cause it got chaotic for 18 months we're talking about, that's like a year and a half. Niall Heaton:	It was chaotic for 21 years, but yeah. Sam Ovens:	What happened in those 18 months? 'Cause you know what to do, you go to do it, but then it all goes crazy, what starts happening there? 'Cause the same time has occurred, things were happening, but what? Niall Heaton:	Yeah, so it's the self sabotage thing, so I'd do well for a week. I'd do the daily routine, I'd get up in the morning at 6:00 AM, I'd do all the stuff and then I'd go out on a Sunday night with my friends, drink too much and then it'd take me another three days to recover, so I didn't ... One thing you talk about and stress a lot in the mindset is memory, so our memories are rubbish really. So reading through your mindset material every morning and every night is the best thing you can do, because even myself, sometimes throughout the day if I don't feel motivated or I can feel myself wanting to procrastinate, I'll go straight back through the mindset material and that'll instantly put me back in the zone, and motivate me, and put me back in a state of power, really. For the last 18 months and before, I never had the mindset material to look at. Well, I had the course but I'd just never done it, so it's unfortunate it took a desperate situation for me to actually take it seriously. It's a shame, really. A lot of people go through ... I'm just fortunate that I was able to learn it all while I'm 21, there's people that are a lot older than me that don't know this stuff. They go through life thinking that they're a victim. But it's a real shame, to be honest, but I'm just glad that I know it all now, while I'm this age really. But it's all relative, I wish I'd have done it all 18 months ago or before, so yeah. Sam Ovens:	You'd stick to this thing for about a week, go out with your friends and then it spirals a bit. After that, like after it spirals, what are you doing during those days, when you're not sticking to what you should be doing? What actions and activities are you doing? Niall Heaton:	Not a lot. Probably feeling sorry for myself. Yeah, the thing is, I'd feel guilty, I'd be laying there as well. I'd be like, "I should be working right now." And then I'd try and psyche myself up to do it and then it'd get to me. I'd think, "Ah, can't be bothered," and I'd go back to bed or ... I genuinely would feel guilty about being laid there but I wouldn't get up and do anything about it. Because I didn't have anything to remind me what my goals were, what I was looking to achieve. I think everyone lays in bed at night and obviously, has a dream and goals of who they want to be and what they want to ... But it's the time before that, it's throughout the day, what you're doing to actually try and get those. It's not just something that has to be in your head before you go to sleep that you're dreaming about or you're thinking, "I wish I had this." It can actually be true, if you do the work and do the mindset stuff. I feel now as if even if I just had the mindset training, I'd be able to be successful at whatever I did. You could have just sold me mindset training. I'd just feel I'd be successful at whatever I choose to do from that point. I'd pay so much more for that mindset training now. I realized how powerful it is and how much it's changed my life. Sam Ovens:	You said that the mindset training, it's changed your life and everything, I wanna really focus in to see what you do when you're not doing what you should do. 'Cause that's what fascinates me the most, 'cause this is the thing that gets everyone, right? It's like what they do when they start feeling sorry for themself, and they know they should be doing what they need to do, but they're not and they keep just not doing it. But how do you not do it? You said you'd stay in bed or something, but you can't do that 24 hours a day, seven days a week. There's a lot of time, it has to be spent doing something. What other things did ... How do you feel sorry for yourself? Like how do you do that? Niall Heaton:	YouTube. Yeah. I'd just find anything, but- Sam Ovens:	What other things? There's YouTube. Niall Heaton:	I pretty much deleted all of my social media accounts because of this problem. The only thing I have is Facebook really. But the worst bit about it is I used to watch YouTube videos of motivational videos and entrepreneur videos. People telling me to get up and do stuff, and I'd be laid there, doing nothing, feeling really guilty, but then I'd say, "Okay, right, tomorrow morning, I'm gonna do it. I'm gonna do it." And then for the rest of the day I'd be like, "Oh, I can just chill for the rest of the day." And then I'd be like, "Right, I'm gonna do it tomorrow morning." And then tomorrow morning, I'd do it and then the same pattern for the next week. I'd build myself up, get some great momentum, if it was summer, even during the week I'd go out with my friends, have a few drinks. Morning after, I get to 6:00 AM, cancel the alarm, wake up. I mean, bearing in mind I still play football too, so I still train pretty much every day, so I'd do that, but I'd get home and just chill and say, "Right, tomorrow morning, I'm gonna do that." Yeah, you can find any way to procrastinate, which is what I found myself. If I don't have YouTube, I'll find something else. Sam Ovens:	You said you deleted your social media too. Did you used to spend a lot of time on that? Niall Heaton:	Yeah, yeah, yeah. I think the main thing ... I don't have an Instagram account anymore, I don't have Snapchat, I don't have Twitter. The only thing I have is Facebook. It was the best thing I ever did. At the time, when you're trying to delete them or you've got them, you think, "I could never live without them." But take it from me, it's the best thing you can ever do. I don't miss them one bit now. And people look at people's lives on Instagram and think their lives are so good. But I think people only put the best of themselves on social media really, so it's ... Yeah, I feel a lot better within myself now, I don't have any social media. I go on YouTube the odd time now and again, when I don't have anything to do really, but that's it. Yeah, it's one of the best, 'cause for many, that was the biggest thing I used to procrastinate on. In my affirmations now on my irrefutable standards, I have I'm not allowed to touch my phone while I'm at my desk, so I'll put it in another room, I'll lock it outside my room, so it's not there to procrastinate with. Whereas before, I'd do work on a laptop, I'd be great and then I'd get an urge or a twitch to go on my phone and I'd go on my phone. I'd see notifications. I'd go on Snapchat, Instagram, whatever, and be on there for the next 10, 15 minutes and then next thing you know, it's half hour's gone by. You're struggling to get yourself back in the zone and concentrate and then, bearing in mind at this time, I didn't have any mindset material to get me back in that zone, so it was just a downward spiral from there really, myself. But I can imagine other people are in the same situation. I can imagine it's not just me, especially in this day and age of all the social media. I think there's just too much information really. [crosstalk 00:35:03]. Sam Ovens:	That's why I really wanted to zoom in on that, because I know that what you did is what everyone is doing. Niall Heaton:	Yeah, 100%, yeah. Sam Ovens:	They wanna be successful, they start at it and then they fall off the wagon, you know what I mean? And I wanna know what does one do when they're off the wagon? 'Cause if you know what that looks like, then you know when to notice that it's happening, so like on social media, looking at other people's lives, feeling sorry for yourself, on YouTube looking at motivational videos. All of these things for other people who are listening, you know if you're doing any of those things, you're in this place, and nothing happens in this place. Niall Heaton:	No, when you're off that wagon, that's it, game over. When you get sucked into this, when you're trying to work, it's so hard to come back and re motivate yourself and get back to that place of focus. That's why I get up early, 6:00 AM, and I try to go to ... Well, I get up at 6:00 AM every day, and that's it. For the first few hours of the day, I'm so focused, it's so easy for me. Even before all this, it was so easy for me to focus for the first few hours of the day. It's when it gets to about 10, 11, 12 o'clock, that's when the procrastination and the boredom starts kicking in. And it's like, "Let me just have a little check on my phone." But if it's out of the room or if it's locked away or like in my example, I've deleted all my social media accounts. There's nothing to procrastinate on, so I could open my phone and try to look at something, but there's nothing to look at. It was the best thing that I ever did was deleting all of my social media. Highly recommend it. You'll think that you're gonna miss it, but you don't. I promise you, you don't. If you do, just re-download it, it's not a big issue really. Sam Ovens:	It's hard to miss nothing. Niall Heaton:	Exactly. Exactly, you realize how much ... Sam Ovens:	How you've been fooled really. Niall Heaton:	Yeah, exactly, it was the best thing I ever did, so again, there's just too much information out there to, you know. If you start following more than a handful or two, one person, like this stuff, I follow you now and that's it. Before, I used to ... Grant Cardone, Gary V, Tai Lopez, he was the one who ... I got in your program through Tai Lopez anyway. But I don't even follow him anymore. I stick to what's in this program and that's it. Yeah, that's pretty much it really. And it's no coincidence that I've got three clients in the last 20 days through doing that, through deleting social media. Sam Ovens:	So that's cool, now we've got how this all happened and how this unfolded. So when you got focused, you went in on to this mindset stuff, how did you then pick the accounting niche? Niall Heaton:	I was in the accounting niche before all the mindset stuff, but when I went thoroughly back through the training, obviously, I wanted to pick an industry where I had some sort of ... I already had a headstart and because I'd been in accounting for that long, I had a good idea about the industry and what people wanted within the ... The clients that they wanted, and as I mentioned earlier, it's not really ... I'm not in the accounting industry anymore, it's more tax professionals who want IRS debt resolution clients. The accounting niche is such a broad niche. You could speak to one person on the phone one day and say they want more bookkeeping and payroll clients, and then you speak to another person on the phone the day after, and they'd say they want more consulting clients, and you know things like that. The niche is so ... The industry's so big that there's so many different products and services that they provide. So again, I looked at your example, you said that your niche was plumbers to begin with, and then the service and the products that you decided to focus down on was hot water cylinder repairs, because that's what the market wanted. So I looked at all my sales calls, and all of my notes, and all my outreach, and the replies I was getting in one thing that was in common was, "Do you get IRS and then state tax debt resolution clients?" At the time, I didn't, but then I kinda thought, "Okay, well a lot of people want this, so that's what I'm gonna focus on." And yeah, ever since I put that into my messaging and ever since I focused on that, just one, rather than getting people payroll or consulting or things like that. I just focused on getting accountants one product and again, best thing that I ever did in this course. Just focusing on one thing, one product, one service, just focusing on that thing. So yeah, it was the best thing I did. Sam Ovens:	So how did you get your first client? Niall Heaton:	In terms of ... Do you mean direct outreach? Sam Ovens:	Yeah, how did that happen? How did you find them and then how did you close them and all of that? What was the story? Niall Heaton:	Yeah, cool. So all of my outreach so far has been organic on LinkedIn. I tried the lump email stuff and the email, but LinkedIn's been great for me. From LinkedIn, when I focused on accounting, I was lucky to get two, three calls a week. This week I've had 15 calls, just by focusing down on one product and one service. It's like once I focused on one thing in my message and in my marketing, the calls just started flooding in because I'm classed as more of an expert now, rather than just a generalist. Yeah, accounting's a niche and it's an industry, and you're narrowing down on one thing, but it's still quite broad. The more you can focus and narrow down the better, and that goes for any industry and any niche. So if you're in dental, then focus on just one product like, I don't know, I don't know much about this market anymore, but let's say it's Invisalign. Just get only Invisalign patients for dentists. Something that they want more of, that's probably my biggest advice to people who are struggling to get clients. If you can just focus on one thing that they want more of, then you position yourself as an expert. So yeah, LinkedIn outreach. I book a qualifying call just to make sure we're a good fit, and then if we are and I feel as if I can get them more clients, then yeah, we book a strategy call and go from there. Sam Ovens:	How do you find them on LinkedIn to start with? You go LinkedIn, you log in, you search, what do you search for? Niall Heaton:	Yeah, there's a paid version of LinkedIn called Sales Navigator. I think it works out at ... I think it's around $70 a month, I think. I'm not sure 'cause I work it all out in pounds. But yeah, and it's great, you can search different keywords, search different industries. We come up with a list of these people that are in these industries, you can look for the owners of these businesses, you can outreach to them there. Yeah, send a connection invite and then you follow up with different messages just to kinda nurture them and ask them, and kick that bruised knee, so to say, with the problems that they have in your messaging. Eventually, they're gonna reach out. If you've got your messaging right, they're gonna reach out. Sam Ovens:	Nice. And then you go from there to a 15 minute chat and then from there to the strategy session, then you use the sales script, get them signed up. Now let's talk about we understand your process. The most interesting piece for me so far has been the falling off the wagon part because all of it gets actually pretty easy, you know what I mean? Niall Heaton:	Yeah, exactly, it's when you're off the wagon, it's game over. Sam Ovens:	Yeah. And that's the biggest lesson for other people to learn, man, is if things aren't moving for you, you're probably off the wagon, you're probably on social media, you're probably on your phone, you're probably playing games, drinking, and you're probably feeling sorry for yourself on YouTube, so you gotta fix it. It's not the niche, it's not the tactics, it's not the training, it's not that one opportunity's better than another, it's that it's you, it's your fault. Niall Heaton:	Yeah, 100%, you're either progressing or you're not. You're never just flat lining, you're never in the middle, just plateauing. You're either getting better or you're getting worse, end of. So if you're not getting better and doing all this stuff, if you're not on the wagon doing the work, doing the mindset stuff, then you're falling behind. And the worst thing is the longer you leave it, the worse it can get, really. You wanna be as consistent as possible, 'cause if you leave it for one day, that turns into two days, two days turns into three days, three days turns into four days, and the next thing you know, you're at a week. And then you start to feel guilty about yourself and then you're like, "Oh, I wish I'd not have stopped doing what I was doing a week ago." And then you get yourself all pumped up again, and then you go again, and then it's just a big cycle, so yeah. One of the biggest things is focus, really. Just focus on one thing. I mean, as I keep mentioning, I'm focusing on one thing at the moment. Try and cut out all the things in your life that you feel are gonna distract you. Like I have a TV in my room here, but it doesn't work. Literally, the cable for the TV I've thrown in the bin, so I can't watch TV. I'm trying to think of anything else. Phone, that's just the big one really. I had a PS4, that got thrown in the bin. Well, it didn't get thrown in the bin, it got given away. So many things. And I know there's probably gonna be people that are watching this thinking, "Oh, I could never throw a PS4 in the bin." 'Cause I was like that but the thing is, you realize, once it's gone, you don't miss it, you never miss it. It's just that initial getting rid of it. Like with the social media accounts, you don't miss it, but when you have them, you're scared to get rid of them. Sam Ovens:	What do you want? A high score in a game on a box or a high score in life? Niall Heaton:	Exactly, like you're playing- Sam Ovens:	Play life, not the game. Niall Heaton:	... Life is the game, exactly. You don't have to play Call of Duty to try and get to the next level, get to the next level in your life. So yeah, that's the biggest advice. Try and get rid of all the distractions in your life. Sam Ovens:	It's funny what you said about your TV, because our TV with our internet connection, we get cable installed for free, right? Niall Heaton:	Yeah. Sam Ovens:	And the lady was like, "With your internet connection, you can have cable." I was like, "No, I don't want cable." And she was like, "Sir, it's free." And I was like, "Yeah, but I don't want it." And she was like, "But sir, it's free, it can't hurt." She was like, "You're literally just missing out on this opportunity." And I was like, "No lady, you listen to me." I was like, "You couldn't pay me money to put cable onto my TV." And she thought I was being an idiot, but she just couldn't see it from that other perspective, you know what I mean? Niall Heaton:	Yeah. People don't understand, yeah. People in this community will get it. When I go back home to my mum's or my dad's, they just don't get it. They see some of the things that I do and they don't get it. Like I've got a TV in my room and I've done the exact same at the one at my mum's, I've thrown the cable away. My mum's like, "What are you doing? Why have you just thrown that away? You could have used that." And I'm like, "There's no point in me even explaining myself because it'll just go right over her head." I've tried to make her read week two of the book, but she's just not having any of it. It would change your life so much, but I can't help people that don't wanna be helped. Like I say, it's a shame because they're my family and they're my parents, but they can't see what I'm trying to do, and that's another thing too. Moving into this house that I'm in now, this rented house is probably the best thing that I ever did. Doing sales calls and stuff when my mum was in the house and my sister, they don't get it and they're like, not laughing at me, but I can tell they think I'm a bit weird in some of the things that I'm doing. My mum gets up for work at 6:00 AM every day, and before when I used to live at my mum's ... So I go through the cycle of getting up at 6:00 AM and she used to be like, "Why are you getting up at this time?" You've got nothing on today, why don't you just lay in?" But there's no point in explaining myself, she just won't get it. So yeah, moving here was one of the best things that ever happened because I've taken control of my life, I've got such a good routine, and that's why I wanna make enough money, so I don't have to move back in after this month. So yeah, life's good at home. Sam Ovens:	Yeah, it's a good one always, is changing your environment. When you change your environment, it changes you. Moving to New York was one of the best things I ever did and I said that to everyone in the program too. If you're in an environment where you feel embarrassed or distracted or anything, get out, change it. I mean it can change everything. Niall Heaton:	Yeah, exactly, and look at ... I'm not gonna lie, I've struggled to be here financially but the rewards now, now I've actually taken it seriously, it's so much better. You don't have to move house. You can rent an office much cheaper than what you can rent a house, and just get out of your environment and change your environment up. It's one of the best things I ever did. I've been in here six months now and after next month, I wanna change again because now I started doing the mindset stuff. I had five months, well, pretty much six months here of not doing anything and getting frustrated because I'm not getting results. But now I'm starting to get results, I wanna change my environment and have a fresh start, and the new character in a fresh place, and a new start. Yeah, that's the next big thing for me. And yeah, the mindset stuff again. I wanna do the up level consulting, up one step, at another stage, because I wanna try stay as lean as possible and I think you can do with a product rather than a service. I don't want massive overheads. Like you guys, the amount of revenue that you make, and you've only got a handful of employees, I think it's great. That'd suit me down to a T. So that's what I wanna do, but I'm thinking of doing something with the mindset stuff like helping athletes with the mindset. I've got so many ideas about it but I need to focus on this first. There's no point thinking about all that other stuff. That's the big thing, you gotta focus on one thing, so when that time comes, that time comes, but not at the moment. Sam Ovens:	Cool. And then, so you've been able to get three clients in this niche and now you're at about nine grand a month recurring, what is in your offer? What do you promise to do for these people? And how do you price it? Niall Heaton:	Yeah, sure. I get the more IRS and state tax debt resolution clients in a more consistent and predictable way, because a lot of these people, a lot of these guys get clients through referrals and it's not a predictable or consistent way to get clients. Now, referrals are great, they can close them pretty much at 90% and above, but it's not reliable. So with what I do, I charge 3,000 a month to manage the ads for these guys, so through Facebook and Google ads, and they have an ad spend too, which is around 2,000 between ... Minimum is between 1,500 and 2,000 a month ad spend, so it works out for these guys around five grand a month. But one tax debt resolution client for these, for some of these guys, they charge five grand a month. So if I can get them two clients a month, then they're paying for this service and more. Anything else is a bonus and it's great. Sam Ovens:	Nice. Three grand a month and you've got three, so you're at nine recurring? That's good. Niall Heaton:	Yeah. Sam Ovens:	That's a good price. So you've made this transformation now. You went from back then 18 months ago, 18 months of being off the wagon and kind of on it and then back off it. And then now you're in, within a month, you've gone from zero to nine grand a month, and all that happened was you got focused. What would your number one piece of advice be for other members in the consulting community? Niall Heaton:	Number one piece of advice? Get this book and go through it. Week two, I'm telling you now. It will be the best thing. If you've already been through it, go through it again. Sam Ovens:	So you've read week two, you didn't watch the videos? Niall Heaton:	No, I've read it all. I finished this book today even. The last section, the sales part, so I feel as if I take it in a lot better by reading it. Sam Ovens:	That's interesting. For other people, maybe they should try reading it. I guess there's less distraction too, right? 'Cause you've just got the book. Niall Heaton:	Exactly, exactly. I'm not saying that that's why I didn't, for 18 months, do anything, but when I can lock my phone in the bathroom, turn everything off in here, put my laptop downstairs and read that book for an hour, two hours straight, no distractions. I can remember certain parts word for word that I could never do with the online stuff. And like you say, yeah, it's because of the distractions. I'd be watching on the screen, but so easy just to go on Facebook or whatever on your laptop. But yeah, the books, they were the best things, yeah, for me anyway. Yeah, the part one book where it's got week two in it, it's got week one, week two, and week three, that's gold. I'd pay a lot more for that now if I knew what it was gonna do. Sam Ovens:	Cool. Well that's some good advice, so if you guys are listening and you're in the program and you're struggling to get on the wagon and stay on it, grab that book, you'll have it, go to week two and the workbook part one and read it. Niall Heaton:	And can I just say as well that I hate reading. I've tried to get books and read them, 'cause I look at what ... You know, a lot of successful people read. Like yourself, you talk about reading a lot, and I've tried but I just can't ... I don't know, I just can't do it sometimes. And again, it's probably down to procrastination and distractions, but with this book, you make it so easy to read too, which not a lot of books are, so yeah, it's great. It's so easy to read and digest, and it talks about the worksheets in the book too, so if ever there's a point where you do need to go to the worksheet, all you have to do is just log on to your laptop, go on to the Consulting.com, print off the worksheets, then close your laptop again and put it out. And then you can work through the worksheets while you're reading the book, which is exactly what I did. So yeah. Sam Ovens:	Nice, I like it. Cool man, well thanks for jumping on and sharing your story. I'm sure it's a good one, because I know that this is what plagues 99.99% of everybody on earth. Niall Heaton:	Yeah. Sam Ovens:	So like it's not just you, it's everyone and there's a lot of stuff from this interview that a lot of people can learn. Shut out the distractions, get focused, discipline over motivation, 'cause motivation's gonna come and go. And just get it done. Niall Heaton:	Yeah. Sam Ovens:	Cool man, well thanks. Niall Heaton:	Yeah. Sam Ovens:	What were you gonna say? Niall Heaton:	Yeah, I was just gonna say it's the more distractions that you can ... The best thing to do is write down a list of the things that distract you the most and get rid of them. As much as you probably don't want to at the time, it's the best thing that'll ever happen to you, I promise, and if it doesn't, then you can just get them back, it's not a big issue. Sam Ovens:	I like it. Cool man, well thanks a lot for jumping on and sharing your story. Niall Heaton:	Yeah, no worries, Sam, thanks for the call. Sam Ovens:	See you. Niall Heaton:	Take care, bye bye.